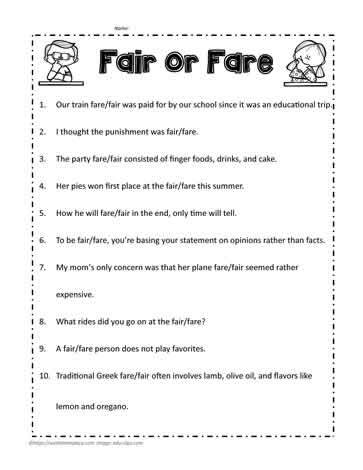 This free printable will help teach the words fair and fare. They are confusing words that students often spell incorrectly. It is not only a great resource for teachers but for homeschoolers as well. I thought the punishment was fair/fare. My mom's only concern was that her plane fare/fair seemed rather expensive. Circle the appropriate spelling of the word.